Año Nuevo State Park draws thousands of people from around the world every year. 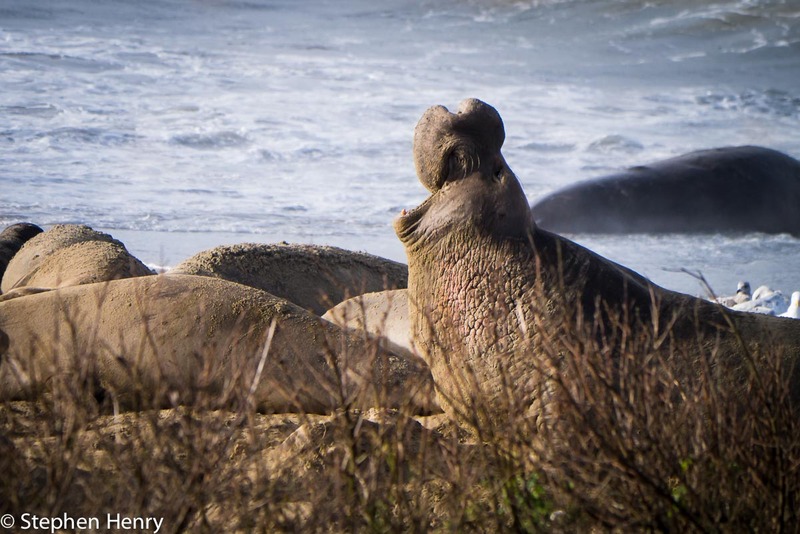 With a moderate walk you can experience this natural environment and learn about elephant seals as well as other features of the park from trained volunteer docents. This park includes the Año Nuevo State Natural Preserve—protecting the mainland's first breeding colony of northern elephant seals—as well as other areas surrounding the park such as Cascade Field, Franklin Point and Gazos Creek on the coastal side of Highway 1 and the Año Nuevo Cultural Preserve on the eastern side of the highway. Preserve Hours: 10 a.m. to 5 p.m. Visitor Center: 8:30 a.m. to 5 p.m.
or 20 miles north of Santa Cruz. Elephant seal viewing requires a 3-4 mile moderate hike over varied terrain, including sand dunes. Driving to see them is not an option. Sturdy shoes, layered clothing, water and rain/wind/sun protection are recommended. Visitors wishing to see the elephant seals and requiring mobility assistance are encouraged to make a reservation for an Equal Access Tour throughout the year. During the breeding season, from Dec 15 through March 31, you can experience the seals within the preserve with a docent-guided walk. Tickets must be purchased in advance, although a few are reserved for sale on the day. 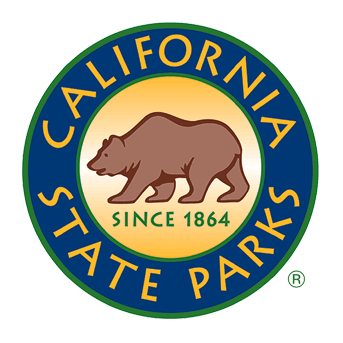 Additional information may be found on the State Parks' website. Throughout the remainder of the viewing year, April 1 through November 30, visitors are able to walk through the preserve to the viewing areas at their own pace after obtaining a free self-guided permit. Volunteer docents will greet you at the viewing stations and interpret what you are seeing. Visitors must exit the Natural Preserve by 5 pm, which is earlier than the parks’ closing hour of sunset. The Natural Preserve is closed December 1 through December 14. Picnic tables are provided close to the visitor center and parking lot. No picnicking is allowed within the Natural Preserve. The park features a complex of buildings that were part of a 19th-century dairy ranch and now house an interpretive visitor center, park store, theater and state park offices. While these restored buildings recall the early American settlers, midden sites throughout the Natural Preserve tell us that Quiroste Indians lived here for thousands of years prior to the 1700s. The physical terrain of Año Nuevo is distinctive with coastal terrace prairie, wetland marshes, dune fields and coastal scrub hosting a high diversity of plants and animals, including the rare and endangered San Francisco Garter Snake and California Red-legged Frog. The area is on a major bird migratory route and is a fantastic birding location. Just offshore sits Año Nuevo Island and the remains of a 19th-century lighthouse and fog signal station. Built in 1872, the original historic keeper’s house can be seen from shore; but access to the island is restricted to rangers and researchers because the island is both a Marine-Mammal and Bird Preserve. The light station was operational until 1948 when the functions were automated on a nearby buoy. Otters, harbor seals, California sea lions are often sighted in the waters and Steller sea lions reside on the outlying rocks in the summer months. Año Nuevo’s waters are protected by a Marine Protection Area (MPA). MPAs contribute to healthier, more resilient ocean ecosystems that can better withstand a wide range of impacts such as pollution and climate change. By protecting entire ecosystems rather than focusing on a single species, MPAs are powerful tools for conserving and restoring ocean biodiversity, and protecting cultural resources, while allowing certain activities such as marine recreation and research. 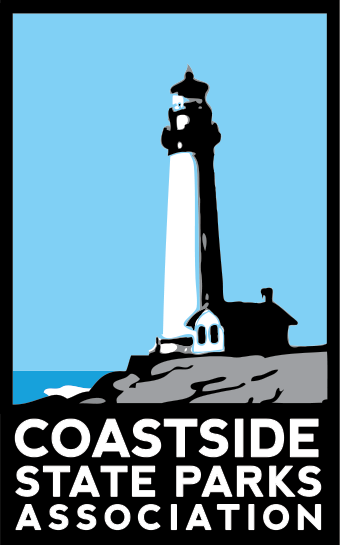 ** All proceeds directly support CSPA’s programs in the State Parks on the San Mateo Coast.